Overview - 50 million people in the U.S.-one in four children-don't know where their next meal is coming from, despite our having the means to provide nutritious, affordable food for all Americans. Directors Kristi Jacobson and Lori Silverbush examine this issue through the lens of three people who are struggling with food insecurity: Barbie, a single Philadelphia mother who grew up in poverty and is trying to provide a better life for her two kids; Rosie, a Colorado fifth-grader who often has to depend on friends and neighbors to feed her and has trouble concentrating in school; and Tremonica, a Mississippi second-grader whose asthma and health issues are exacerbated by the largely empty calories her hardworking mother can afford. Their stories are interwoven with insights from experts including sociologist Janet Poppendieck, author Raj Patel and nutrition policy leader Marion Nestle; ordinary citizens like Pastor Bob Wilson and teachers Leslie Nichols and Odessa Cherry; and activists such as Witness to Hunger's Mariana Chilton, Top Chef's Tom Colicchio and Oscarr-winning actor Jeff Bridges. Ultimately, A Place at the Table shows us how hunger poses serious economic, social and cultural implications for our nation, and that it could be solved once and for all, if the American public decides-as they have in the past-that making healthy food available and affordable is in the best interest of us all. Human beings need to eat. Beyond any personal, ideological, or political differences that might stand between us, that's an irrefutable fact -- a binding necessity that unites us all at the behest of a universal essential. And despite the apparent simplicity of this basic requirement, it turns out that millions of Americans go hungry every day, going to sleep unsure when they will see their next meal. From directors Kristi Jacobson and Lori Silverbush, the documentary film 'A Place at the Table' attempts to address this very important issue, shining a light on the human faces, empty bellies, and harrowing statistics behind our country's increasing struggle with hunger. Informative and relatively engaging, the movie does a very solid job of covering the material, but ultimately lacks some of the overall impact it strives for. More of a slightly subdued cinematic call to action than a true attempt at artistic expression, the doc is fairly satisfying but might leave some viewers craving a bit more bite. After a soothing yet faintly somber main title sequence set to aerial images of farmlands and cityscapes, the movie begins its multifaceted examination of hunger in America. Primarily focused on the problem of "food insecurity" (a term used to describe a situation where individuals are unsure where their next meal will come from), the filmmakers dissect the reasons behind, consequences of, and possible solutions to hunger and poor nutrition in our country, drawing direct parallels between food insecurity, obesity, and poverty. To this end, emphasis is mostly placed on the epidemic's negative effect on children as the doc follows several families struggling to put food on their tables. In addition to the personal stories and intimate peeks into food insecure households, the film also features traditional talking head interviews with various doctors, authors, nutritionists, politicians, chefs, and… Jeff Bridges. Animated statistics and graphs are thrown in as well, giving some visual variety to the steady stream of information. Throughout the runtime, the filmmakers cover all their bases, transitioning from emotional segments focused on the hardships of hunger on a one-on-one level, to larger discussions aimed at critiquing policies and societal trends that may have influenced our current situation, including government farming subsidies, poor legislative rulings, problematic school lunch systems, and inefficient food stamp programs that have turned healthy eating into a commodity available only to those who can afford it. This mixture of stats, opinions, and personal segments is balanced fairly well, and the filmmakers do a decent job of forming a basic narrative throughout their numerous participants and subplots. This is especially true of single mother of two, Barbie, who gets the most comprehensive arc, and it's these intimate portraits of real, struggling, hungry, hard working families that end up being the doc's most compelling and affecting feature. Unfortunately, there are times when these sequences seem a little underexplored and some of the subjects' stories feel slightly abandoned, unrealized, or a tad detached. Unlike other documentaries that attempt to form more objective examinations or artistic commentaries on their subject matter, 'A Place at the Table' is clearly an activist film through and through with an unambiguous agenda and goal. The filmmakers have a specific message they want to get across about the relationship between hunger and poverty in America and the government's place within such matters. Thankfully, despite this blatant ambition, the movie mostly avoids the type of preachy, overly didactic qualities that plague many similar efforts. With that said, there are times when the film's clear leanings might irritate some viewers. On the other hand, much like producer Tom Colicchio states in the included commentary, hunger really is a nonpartisan issue, and while some might not agree with the movie's conclusions about how to solve the problems addressed, the insights it offers on the dilemmas themselves are certainly worthwhile and important. Giving a voice to the 50 million food insecure Americans who go hungry every day, 'A Place at the Table' provides viewers with an educational and frustrating experience, exposing unnecessary hardship at the hands of a seemingly avoidable problem. The movie's emotional component can be a little unfulfilled at times, but there are some genuinely affecting observations and revelations to go along with all the statistics that will leave many shaking their heads in disbelief. Though the documentary doesn't completely succeed in fervently rallying up the audience in its cause, it offers more than a few eye-opening insights. Despite a clear objective and obvious political slant, the movie's message doesn't come across as too preachy or overbearing. Like a well balanced meal, the film has all the basic components one needs, even if it could have used a little extra spice here and there. 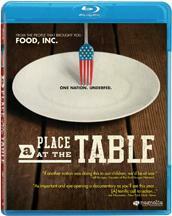 Magnolia Home Entertainment brings 'A Place at the Table' to Blu-ray on a single BD-25 disc housed in a keepcase. Some skippable trailers play upon start up before the disc transitions to a standard menu. The packaging indicates that the release is Region A compatible. The film is presented in a 1080p AVC/MPEG-4 transfer in the 1.78:1 aspect ratio. Though perfectly serviceable, the doc suffers from a mundane, low-grade appearance and there are some noticeable artifacts here and there. The digital source is decent but there are minor signs of aliasing, shimmering, noise, ringing, banding and stability issues throughout that can be distracting. Unlike many documentaries, the film is mostly comprised of new footage but there seems to have been a mixture of shooting equipment used and the overall image suffers from a comparatively low grade HD appearance with average detail and a flat look. In fact, there are a few shots that look more like upconverted SD than true high definition material. The opening aerial footage of various American landscapes and cities are the most impressive, but the aforementioned artifacts do detract from the picture. Colors are relatively drab and washed out with little pop, and the picture can look a tad dim. Contrast is solid but some shots feature overexposed whites and light blacks. 'A Place at the Table' is an average looking film, but its modest video presentation suits the content just fine. The fly-on-the-wall footage and talking head interviews aren't as pristine or glossy looking as they are in some other docs, but the film's message is conveyed regardless and the transfer is certainly adequate and seemingly respectful to the source elements. The movie is provided with an English DTS-HD MA 5.1 track. Optional English SDH and Spanish subtitles are also included. Though a bit more engaging than the video presentation, the audio mix is also relatively basic. Dialogue and narration are clear and clean throughout with no balance or technical issues. The audio is front heavy with little surround activity, but the musical soundtrack (which includes original songs by T-Bone Burnett and The Civil Wars) features solid stereo separation and fidelity. Outside of music and speech, there isn't a whole lot to the mix, but there is some minor directionality when appropriate. Dynamic range is on the flat side, but highs and lows are both clean with no distortion and there is some marginal bass activity within some of the music tracks. Unassuming but fitting, the mix does a nice job of complementing the film with just enough variety to keep things interesting. Magnolia has provided a nice collection of supplements, including a commentary, deleted scenes and additional interviews that elaborate on many of the film's topics. All of the special features are presented in 1080p with Dolby Digital 2.0 sound and no subtitle options (unless noted otherwise). Commentary with Directors Kristi Jacobson & Lori Silverbush and Producer Tom Colicchio - The trio offer a steady and informative track that mixes production trivia with more details on the movie's subject matter. The filmmakers discuss the music, meeting the various participants, and developing the animations, but spend the majority of the time expanding upon issues dealing with hunger and reiterating the documentary's goals and message. Though there are some brief gaps here and there, those interested to learn more about the issues addressed in the film should find this track to be very worthwhile. Deleted Scenes (HD, 13 min) - Four deleted scenes are viewable separately or together. Though some of the footage is repeated from the film, these are all worthwhile bits, especially a sequence featuring Barbie telling her story to a live audience. Deleted Interviews (HD, 14 min) - Deleted interviews with Jeff Bridges, Tom Colicchio, and Adam Appelhanz are viewable separately or together, providing a few more details on the End Hunger Network, the relationship between meals and family, and government farming subsidies. Cast & Crew Interviews (HD, 38 min) - Interviews with producer Tom Colicchio, director Kristi Jacobson, and director Lori Silverbush are viewable separately or together in 1080i. The participants address how they got involved with the project and detail their inspirations for the movie, their ultimate goals for the doc, and the joys of getting to interview Jeff Bridges. AXS TV: A Look at 'A Place at the Table' (HD, 5 min) - Presented in 1080i, this is a brief and redundant promo piece featuring clips from the movie and snippets from the previous interview segments. A Place at the Table - The Book - This is simply a text ad for the film's companion book. A Good Day (HD, 2 min) - This is a PSA animated short about food insecurity (it also plays upon disc startup before the main menu appears). The Full Effect: Plum Organics Mission to Nourish Children Across America (HD, 4 min) - Here we get a PR ad for the company Plum Organics which aims to improve nutrition for "little ones" with their line of baby food. 'A Place at the Table' is an informative and enlightening documentary about hunger in America. While the film's emotional component doesn't quite hit as hard as intended, and its larger activist agenda is rather blatant, it's still a very worthwhile and appropriately frustrating effort that will likely leave many viewers outraged. The video transfer is average but serviceable, and while very basic, the audio mix is solid. The included supplements provide lots of additional details on the film's various subjects, elaborating on many of the important topics touched upon. The movie might lack a true artistic voice, but the real life stories and dilemmas it examines are sensitively and respectfully explored, resulting in an educational and ultimately powerful documentary. Well worth a look.